TREATS IN THE POCKETS + FAVE LINKS | jeni a. Her immediate reaction – on the left. The ensuing emotions – on the right. Pure, sweet joy – on the left. Total seriousness – on the right. She's like, "Come on toots, work with me here..." HA. Then Babe went off to lala land, indulging all the way. Aren't grandmas the best? 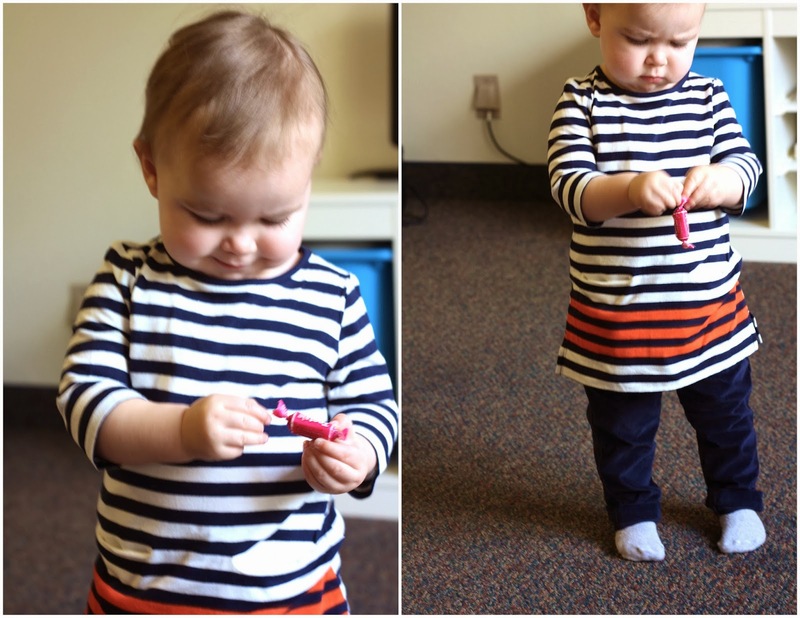 I mean, I would have never thought to put tootsie rolls in my daughter's shirt pockets - just for fun. I so need my mom's creativity and funness in my life. Wish you were here, Mom! Thank you for being the best. Love you sooo much. 1 | Joy Laforme's Patterns. I am particularly in love with the Watercolor Floral group. She is such a fabulous artist. 2 | Another fabulous artist - Caitlin Connolly. This piece, Doing Things Together, is a newfound favorite for me because it's absolutely lovely and exactly what Ryan and I are working to be. 3 | This DIY for Pom Poms + Leather Luggage Tags was done really well and that stuff is really cute. 4 | Awesome clip here: Mormons: a Christ-centered global faith. 5 | Win an iPad Mini?? Yes, please! I need to get some lavender! Can i order that from you? The stretch marks are starting to show up and I need to get rid of them asap! Ah! Yes! That will help. You can't really get it from me - I'm not a distrubtor. Just hosted the class :) Email me and I'll give you some names of distributors in Santa Clara!